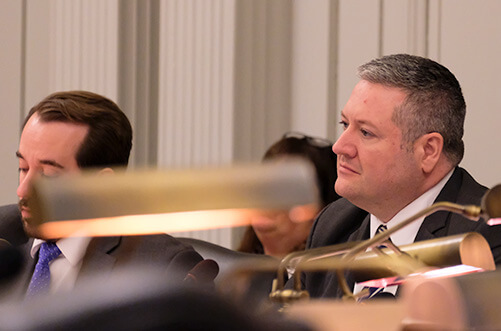 The New Jersey Assembly Transportation and Independent Authorities Committee held its first meeting of the 2018–2019 legislative session under leadership of its new chair, Assemblyman Daniel R. Benson and vice chair Patricia Egan Jones. 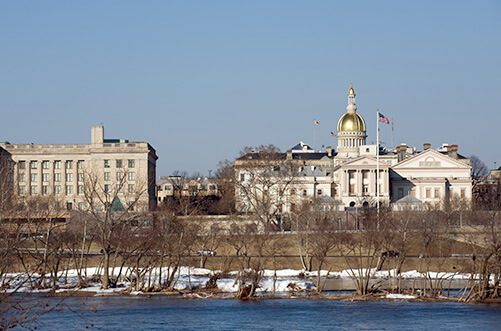 The meeting was held at the State House Annex in Trenton on February 1, 2018. Benson invited CAIT and other transportation experts, advocates, and industry people to share their expertise and knowledge on pressing issues so the committee might gain “a better understanding of the matters before it” and inform legislation that should be pursued in the upcoming session. There was no shortage of suggestions from stakeholders. The February 1 meeting ran long so those who did not have a chance to speak rescheduled for a second meeting on February 12. Over the course of the two meetings, the committee heard from several organizations that have shared concerns regarding labor, environment, safe and fair transportation, and other community interests. Representatives from AAA, New Jersey Future, Tri-State Transportation Campaign, Work Environment Council, and higher education came to share their thoughts. 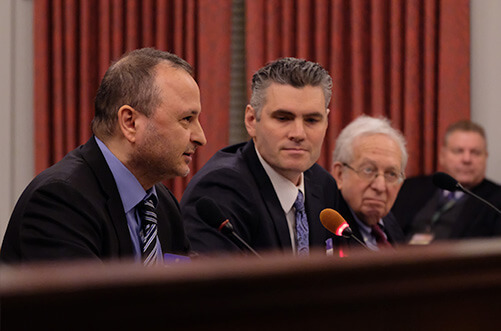 Dr. Franklin Moon, School of Engineering associate professor of civil and environmental engineering and a CAIT researcher, covered several salient points in his testimony, among them the particular strain on New Jersey infrastructure. He also pinned many of the state’s problems on funding—an issue that has plagued many states across the country. “Up until the enactment of recent legislation, which allocates revenue from motor fuels taxes to transportation purposes, the state was not able to fund new projects and all remaining revenue was being used to pay off existing bills. … after 25 years of not changing how we fund, it’s time to decide on a long-term funding fix for transportation in New Jersey,” Moon said. Another issue Moon addressed was the need for our infrastructure to be made to last as well as more resilient as we face more extreme weather, but also accounting for “routine” flooding we are experiencing more and more frequently. “Every time we start a project we should see it as an investment in the future,” he said. “Over a 10-year period, ridership has increased by more than 16 percent on New Jersey’s three most heavily relied-on transit systems: NJ Transit, PATH, and PATCO.” Maher went on to explain that this increase in service demand has NJ Transit operating near or at capacity in peak hours, subjecting the system to significant strain. In key areas, particularly the Hudson River crossings, bus and rail transit are not only operating near capacity but also in need of major rehabilitation. Maher offered that researchers could generate or support strategies to deal with these and other challenges. Both professors encouraged lawmakers to view higher education institutions as a key partner and a resource for training the current workforce on emerging tools and practices and for creating “next gen” technologies that improve durability, performance, and economics whether it’s preserving the assets we have or those we build going forward. New Jersey has some of the most heavily used and oldest infrastructure in the country. Maher and Moon cautioned against inaction and lack of investment. Moon reminded the committee that long-term consequences could be dire. “Without planning, the state’s economy, quality of life, [growing tech industry], and its ability to maintain its role as a national leader in innovation will be seriously undermined. The result: underdevelopment, loss of population, and gradual decay,” he said. Maher and Moon tempered their comments about New Jersey’s transportation problems by offering reasons to be hopeful about the future. They pointed to the explosion of new and superior materials; advanced technology in diagnostic tools, robotics, and big data; and powerful asset management and life-cycle cost analysis systems. They also stated that, as a USDOT National University Transportation Center, CAIT is here to support all organizations toiling to make New Jersey infrastructure the best it can be. CAIT director Dr. Ali Maher and bridge expert Dr. Frank Moon testifying before the NJ Assembly transportation committee. Photo Rutgers CAIT/©A. Thomas. Daniel R. Benson, new chair of the NJ Assembly Transportation and Independent Authorities Committee, listens intently to ideas put forth by groups concerned with jobs, the environment, safety, community, and solving transportation challenges. Photo Rutgers CAIT/©A. Thomas.